55 Videos addressing key concept of scrum framework. 6 PDUs and 6 (Category B) SEUs. Support in clearing concepts and doubts via FORUM. The Scrum Master Course is completely based on scrum guide. Scrum guide is a reference for all Scrum Alliance Program. Do you understand the real intent behind Scrum roles, events, artifacts, and the rules of Scrum Framework?Scrum looks promising and exciting to those who implement it well and confuses the others who are unable to understand the concept.Our online Scrum Master Course explains various software development situations using Scrum Framework. What is Agile and how it emerged over the years? Successful Scrum implementation, Scrum principles, roles, rules,artefects and Ceremonies. Anyone willing to understand Scrum and how it works. 2 practice tests, each contains 80 questions. This is one of the best rated and recommended certification courses across social media. Quickly check the sample video below to understand how this course will work. Our course includes lessons for empirical process theory supporting roles, rules, artifacts and ceremonies of Scrum Framework. Students learn through class room style videos and practical exercises supporting the software development. We chronologically arranged logical division of the course, course content that makes studying pattern simple. Knowing Scrum:Learn Scrum in Action to solve complex problems. What is Agile? : Understanding of agile values and principles and also the need of agility in current business environment. Scrum Roles: Each of Scrum roles has a defined set of responsibilities. Learn about Scrum Roles to understand these responsibilities and how they closely interact to meet the goals successfully. Sprint: This lesson explores how iteratively and incrementally potential shippable product increments is created. Product Backlog: This lesson covers conceptual learning and understanding of ordered list of requirements. Planning Sprint: Scrum Framework recommends continuous planning. Lesson covers two levels of planning – release and sprint including sprint planning meeting, sprint backlog, definition of done and release planning. Executing & Monitoring Sprint: Once sprint planning is done, we need executing, monitoring and adaptations. This lesson discusses how Scrum Events helps in execution and monitoring. Concluding Sprint: A sprint is concluded with Sprint Review and Sprint Retrospectives. This lesson explores these events in detail. Scaling Scrum:Scrum Framework can be used when multiple teams are working for the same product development. This lesson takes you to the art of scaling scrum. Q. Which are popular scrum master certificates? A. Scrum has emerged as a popular software development practice, there are many internationally recognized certificates such as Certified scrum Master from Scrum Alliance and Professional Scrum Master from Scrum.org. Q. Can I get a Scrum Master certificate without a classroom training? A. Yes, professional Scrum Master (PSM) does not require a classroom training, you can check the eligibility criteria at scrum.org and enrol for the exam directly once you are prepared. Q. 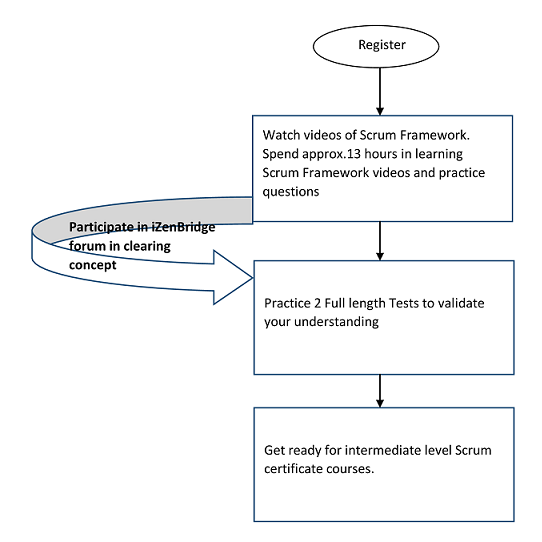 How does this program prepare me for Professional Scrum Master (PSM) certificate? A. This program is based on scrum guide which is the base reference for scrum certificates like PSM and CSM. We have simulation exams to validate your scrum understanding, if you score well in our simulation exams, you can consider yourself prepared for the scrum certification exams. Q. Can I give CSM certification exam after attending this online program? A. The online Scrum Master program will prepare your for the CSM certificate, but as per Scrum Alliance two days in-person class is mandatory before enrolling in CSM exam. Q. What is the scrum certification cost? A. Professional Scrum Master Certification exam will cost your 150 USD. CSM training and certification cost is collected by the trainer and varies. Q. Does this program guarantees the passing of Scrum Master Certification exam? A. We assure you will be able to clear any Scrum Master Certification exam if you study well with our program and your score is above average in our simulation exams. Q. How much time will it take to get certified? A. Approx. 10 to 20 hours preparation. Q. Whom should I contact if I have additional questions?